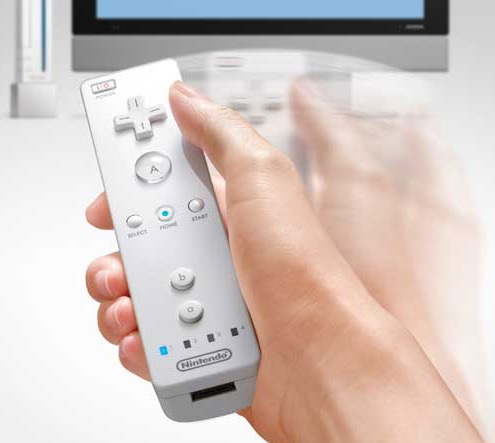 Wireless: Wireless control leaves you free to get up, dance around, make big gestures — see Nintendo’s video. Air guitar may never be the same. 3D motion and gestures: With tilt and directional sensors (including apparently infrared), you have X, Y, and Z control. The upshot: you’re free of buttons and stationary gear, free to make gestures with your arm — think Theremin, but with even more space to explore. Ready to rumble: The challenge of free movement in space is that, unlike the keys of a keyboard, there’s no reference — tricky for musical pitch, etc. Vibration, as found on the Revolution controller, could give some feedback. It’s nothing compared to full-blown haptics, which will provide subtle physical feedback so you feel like you’re waving your arms through actual substance — that’s next. Modular expansion: You can expand the controller with other controls as you need, like an analog joystick, then remove them when you don’t need them. If only music hardware were so flexible. Could you do this yourself? Sure, there are DIY lessons to be learned here. You can replicate some of the sensors and tilt/3D motion using off-the-shelf sensors from folks like Making Things, or using a consumer gyro mouse. It may not look white and slick like the Nintendo gear, but it won’t get you sued, either. And you can make it look really angry, or cover it with fur, or whatever you like.